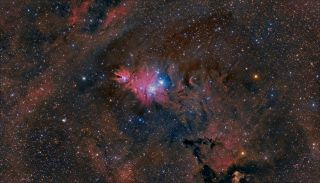 The Cone Nebula (left of center), the Christmas Tree star cluster (top of the tree next to the Cone Nebula) and the Fox Fur Nebula (center) are located roughly 2700 light years in the constellation Monoceros. This image was captured by Terry Hancock of DownUnder Observatory in Fremont, Mich., and Robert Fields of Irving Observatory in Howell Township, Mich. and sent to Space.com on April 11, 2014. Two Michigan-based astrophotographers combined their skills to capture this brilliant image of the Cone Nebula, the Christmas Tree star cluster and the Fox Fur Nebula. Avid night sky photographer Terry Hancock of DownUnder Observatory in Fremont, Mich., used a QHY11S monochrome CCD cooled camera, Takahashi Epsilon E-180 and Paramount GT-1100S German Equatorial Mount. The Cone Nebula (left of center), the Christmas Tree star cluster (the top of the tree is next to the Cone Nebula) and the Fox Fur Nebula (center) are located roughly 2,700 light-years in the constellation Monoceros. One light-year is the distance light travels in a single year, which is about 6 trillion miles (10 trillion kilometers).Hubble's Variable Nebula, or Caldwell 46, also appears toward the lower left of the image.